A strange, alien sphere is on a collision course with Earth, and only Rex Dexter of Mars and his companion Cynde can stop it! Space Crusaders is a new series from Atomic Action Comics an imprint of Atomic Pulp. It is 40 pages of stories, first with Rex Dexter of Mars, then with Lance Lewis, Space Detective. If you love golden age heroes or if you love 1970’s style stories and art, this is one new comic series that y ou would love. 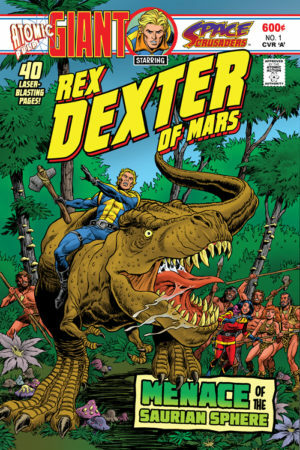 Rex Dexter of Mars, a golden-age space opera hero created in 1939 with roots based off of Flash Gordon, has been revived as the hero of this series. Written by Christopher Mills with art by Peter Grau and colors by Matt Webb, this story is a loose sequel to the 1940’s stories but you don’t need to read those to understand this story. In the first story, while exiled from Earth, Rex Dexter must investigate an alien sphere and the second story, set aboard a space station, Lance Lewis must track down a stolen alien artifact. The stories are fluid, never boring, with the action scenes solidly paced. Mr. Mills’ stories are entertaining and I can see them as space opera stories from yesteryear. Oh, and the Rex Dexter story has a Tyrannosaurus Rex to boot. The artwork is vibrant and it does remind me of the seventies type art that Atomic Pulp is going for. Beautifully done, if you are a fan of Neal Adams, Jack Kirby, Bill Everett, John Romita Sr., or other Silver or Bronze Age artists, you will find yourself home here. Overall, if you are a fan of modern day comics and stories, you probably won’t like this. However, if you are a fan of older story types with art that is nostalgic from times gone by, this is one comic you need to check out. Cover Artists: A & B – Peter Grau; C – Gabriel Rearte. Softcover & Digital: 47 pages, full color.